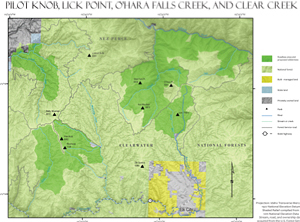 Pilot Knob, Lick Point, O'Hara - Falls Creek, and Clear Creek Click to enlarge and zoom on the map. The 21,000 acre Pilot Knob Roadless Area is north of Highway 14 and east of Grangeville, Idaho. It includes the upper two-thirds of Silver Creek and several small tributaries of Newsome Creek. The elevation ranges from around 4,000 feet at the lowest point in Newsome Creek to 7,000 feet at the region’s most distinctive geologic feature – Pilot Rock. A massive, bare rock face near the center of the area, Pilot Rock is flanked by a visually pleasing mosaic of boulder outcroppings, sweeping meadows, and lush forest. The contour profile of the whole area is generally homogeneous rolling hills with a consistent forest cover. Vegetation types are diverse; old-growth grand fir stands are prevalent next to Newsome Creek. Moist grand fir and subalpine fir types cover the majority of the area, with small, wet openings dominated by Engelmann spruce and alder scattered throughout the Silver Creek drainage. The slender, blossomed stalks of Candystick and Evergreen kittentail (both sensitive plant species) can be found underfoot. The area supports elk, deer, moose, fisher, and bear populations, and taken with Clear Creek Roadless Area to the north is a yearlong Gray wolf habitat. The upper portion of Silver Creek contains a thriving population of introduced eastern brook trout, and Newsome Creek and its tributaries provide an essential haven for anadromous fish and native species. This swath of country may contain undiscovered historic and prehistoric cultural traces. Along the northeastern boundary of the Pilot Knob Roadless Area is the historic Nez Perce Trail, which was used by Indians long before the time of mountain men and miners. This trail was the main access route to Idaho County mines of the 19th Century, which later became the Elk City Wagon Road, and still later, was improved to accommodate motor vehicles. More significantly, Pilot Rock is an ancient vision quest locale for the Nez Perce Indian Tribe. The Tribe is presently negotiating with the Forest Service to establish an undisturbed area around this inimitable sacred heritage site. Access roads traversing the area and running the distance to Pilot Knob Lookout mean the region is threatened by erosion, displacement, and damage associated with ORV use. This road corridor is not included within the boundary of the roadless area. Mining activity just outside the boundary of the area is not widespread, but in view of past mining history, interest continues and 12 unpatented mining claims exist within the area, thus running the risk that crucial ecological habitat could be spoiled. Protection for Pilot Knob Roadless Area is essential to ensure the integrity of the resources in the area.